A few days ago, being too lazy to cook, my fiance and I decided to try out a restaurant in the area. It was a hole-in-the wall Indian restaurant with a great Indo-Chinese menu. Almost as soon as we took the first bite into our noodles, both of us impulsively reached for water. While the food was delicious, we had soon gone through two glasses of water each, we each had a runny nose, and the spice still lingered in our mouth. I remembered then that water doesn’t work to curb spice, and ordered some mango juice instead. And that did it. The spice began to dissipate. Though I knew from friends and, well, personal experience that water doesn’t work to curb spice, I still didn’t know why. And the fact that milk is said to work better to tone down the heat? Why did that work? Most restaurants don’t have the option to order milk as your beverage of choice, so what do you do to relieve the spice? After much research, I managed to find some answers. The molecule that causes spice is called capsaicin. 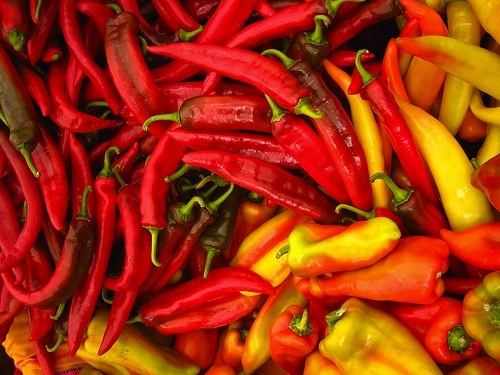 Contrary to some opinion, capsaicin is NOT made in seeds of chili peppers. Rather, it’s produced in the fleshy white membrane that the seeds are attached to. But because capsaicin is in such high concentrations on the membrane, the spice is transferred to the seeds as well. Note the long tail that the molecule has, i.e., everything to the right of the oxygen jutting down. This long tail, which is made up only of carbon and hydrogen atoms, is the reason that capsaicin is insoluble in water. It’s basically like an oil and water mix. The water does nothing but move capsaicin around your mouth, which is why sometimes you feel water aggravated the problem instead of alleviate it. But the hydrocarbon tail also makes the molecule soluble in lipids, or fats. Contrary, again, to some opinion, milk and milk products are mainly helpful not because of their fat content, but because of the presence of a protein called casein. Like capsaicin, casein is also insoluble in water and soluble in fat. Like dissolves like, and so capsaicin dissolves easily in casein, dissipating the spice. So if milk is unavailable, look for other milk products like cheese and butter (If you’re at an Indian restaurant, ask for some ghee, or clarified butter; it’s a staple in every Indian household for this very use). 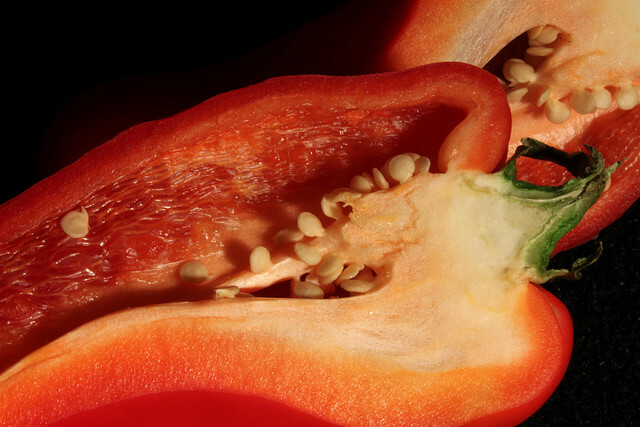 Casein, or the lack of it, is also why some oily foods are still spicy. Chinese food mostly uses sesame and peanut oils and casein is found in animal, particularly mammalian, milk. Sesame, peanut and other vegetable oils still help because of their ability to dissolve capsaicin, but to a lesser degree than milk products. So water doesn’t work, you don’t have any cheese or butter, but there are still a few other options to try. The first, luckily enough for some, is alcohol. Alcohol is fat-soluble. So it will dissolve capsaicin. And naturally, the higher the alcohol content, the more it will dissolve capsaicin. If you’re at Mexican restaurant and treat yourself to too much habanero, have some simple guacamole. The high fat content in avocados will help curb the spice. And if all else fails, get some dessert. While they tend to be sweet, which will be a nice break for your mouth, they also tend to have a high fat content and will dissolve capsaicin.